History was made on Wednesday night at a sun-drenched Clanabogan Park when Drumragh Ladies secure their, and indeed the Club’s, first ever win at senior level. It was a hard fought but merited 3 point win over a spirited Sperrin Og team in a game which was in the balance up until the final whistle. Drumragh started brightly and took the lead after 5 minutes when Breanna Breslin fired to the visitor’s net from close range. Sperrin Og struck back almost immediately with a Claire Tuohy point before Amy Cox restored Drumragh’s three point lead with a fine point from an acute angle. Another Cox point cancelled out by a point from Niamh O’Neill left the score at the end of the first quarter Drumragh 1-02 Sperrin Og 0-2. Both sides traded scores in the second quarter, Drumragh’s scores coming courtesy of Clodagh Loughran and Amy Cox as both defences gradually got on top with the half time score Drumragh 1-04, Sperrin Og 0-4. The visitors began the second half brightly and scores from Niamh O’Neill and Ciara Fox reduced Drumragh’s lead to the minimum score before a Clodagh Loughran point took the gap out to two points before O’Neill once again reduced the lead to a point. On 41 minutes, the tireless Neamh Woods scored the home team’s second goal. However just when Drumragh had gained some breathing space, back came Sperrin Og with a goal of their own following a great block by Claire McLaughlin. The home team responded to this setback with two quickfire points from Woods and Cox to leave three between the teams. Entering the final ten minutes both sides traded scores with Amy Cox once more on the mark for Drumragh. 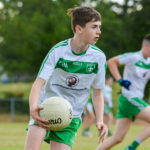 However with eight minutes remained, Sperrin Og drew level when a speculative shot from distance by Niamh O’Neill ended up in the Drumragh net and the game was right back in the melting pot. However the home side were determined that the game would not slip away from them and urged on by the home support, the Drumragh ladies upped the intensity and Clodagh Loughran put them back in front with a well taken point. 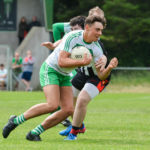 Neamh Woods added 2 further points before referee John McGlynn brought proceedings to a close with the final score of Drumragh 2-11, Sperrin Og 2-08. This was a tremendous result and while there were strong individual performances throughout the field it was the overall team ethic which saw the Sarsfields ladies over the line to their historic win. The defensive unit of goalkeeper, Oonagh McMackin Saoirse Mullin, Claire McLaughlin, Joanne Barrett, Beth Donaghy, Coblaith McKenna and Rachel Clearly were outstanding while Neamh Woods and Laura Harkin put in a massive shift throughout the 60 minutes. The forward line of Grace O’Neill, Amy Cox, Mairead Harkin, Claire McGread, Clodagh Loughran and Breanna Breslin worked extremely hard to create scores and to nullify the attacking threat of the Sperrin Og defence.